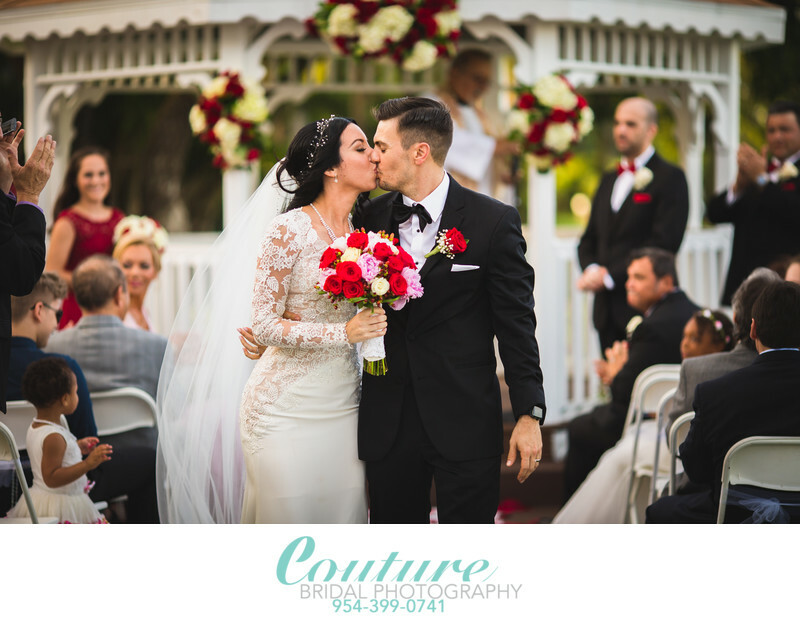 Couture Bridal Photography is known throughout South Florida as the top wedding photographer in Boca Raton, Florida. We are the preferred photographers of couples throughout Florida and around the world planning weddings throughout Boca Raton. Couples book us for our unique and distinct photographic style that blends wedding photojournalism, fashion, editorial and glamour photography to create heart warming and spectacular photographs. The most exciting part of a wedding day for us, is during the days preparations. This is a time where we photograph the interactions betweens the brides family and bridesmaids are they prepare for the marriage ceremony. During the prep we capture a variety of emotions and details that set the pace for the entire day. We photograph the brides gown, jewelry and tender moments of the bride and her parents typically filled with emotion. Capturing tears of joy, laughter and the anxiety leading up to the wedding ceremony provides for compelling photographic story telling. Not to overlook the importance of the groom, his parents and groomsmen, we also capture the same feelings and details during the grooms prep. The groom and groomsmen photos provides a different side to human emotion. The groom is typically just as nervous leading up to his wedding day, but use funny antics and joking around to hide their stress. The wedding day prep which usually takes place in separate bridal suites is the first chapter that sets the tone for the wedding day. Additionally, this is when we really have the opportunity to look into and become an integral part of our brides and grooms lives and wedding. Depending on the wedding day timeline, we take the opportunity to create beautiful portraits of the bride and her bridesmaids before the wedding. We use the background and atmosphere of the hotel or resort where they are doing their wedding prep. We carefully plan this time, so that the bride and groom do not cross paths before the wedding. We create beautiful portraits with our distinct and unique style of photography that has made use the biggest and most trusted name in wedding photography in Boca Raton. We also create strong masculine portraits of the groom and groomsmen to create a complete collection of photos that tell both sides of the bride and grooms wedding day story. When we are photographing the bride and groom separately before the ceremony, our unique photography style truly shines. The wedding ceremony is the most critical part of the wedding day. Photographing the bride and groom as they say their vows and officiant carries out their duties is where many candid photos of the couples emotions and interactions take place. During the ceremony is when photojournalism become the predominant photography approach. There is no way to pose, direct or instruct the bride and groom as their ceremony is taking place. It is also important to work in a clandestine fashion to be unobtrusive or distracting the the family and guests in attendance. Wedding ceremonies take place in a variety of locations in Boca Raton, Florida. Couples may choose a beachfront wedding ceremony at the Boca Raton Beach Resort, Golf Course at the Waldorf Astoria Boca Raton Resort and Club, the intercostal at the Waterstone Resort and Marina, a Garden setting at the Addison, or in one of the many houses of worship throughout Boca Raton. Our photography style involves creating and capturing a variety of angles, compositions and perspectives during a wedding ceremony using our distinct and dynamic photojournalistic photography style. After the wedding ceremony, wedding portraits are typically taken with the bride, grooms, bridesmaids and groomsmen. We also include close family members and friends to create wedding portraits before setting off to a location to photograph the bride and groom. When working with the bride and groom during the wedding portrait portion of their wedding day, we use a mixture of fashion and editorial photography to create spectacular and dynamic photos that will become heirlooms. Depending on the couple we are working with, we may take and illustrative photography approach that is photojournalistic with a bit of direction to create really beautiful pictures. We've become very popular for our elegant, romantic and timeless wedding portraits couples typically print large format images from to hang in their homes. Our unique and distinct style of wedding portrait photography has made us the most popular and sought after wedding photography studio for couples having weddings in Boca Raton. During the cocktail hour is when we slow our pace and prepare for the reception. We do photograph the bride and groom as they interact with family and guests to capture laughter and the ambience of the event. The cocktail hour is a great time to capture fun and memorable candid moments. Another task we take on during the cocktail hour is the decorations, flowers and tables in the reception space. This is a very important portion of our wedding photography coverage that can never be missed. Brides and grooms want beautiful well exposed photos of their wedding reception space before the guests enter to see what it looked like undisturbed. Capturing these detailed images of the floral design, decorations and ambience show the style and theme of the brides and grooms wedding. The wedding reception begins with introductions of the bridal party, parents and now married couple. The celebration of their marriage begins with a first dance as man and wife. As the bride and groom perform their first dance is when we use a photojournalistic approach to create beautiful photos of the bride and groom, as family, friends and guests look on in the background. Using a variety of lighting techniques we capture beautiful unscripted tender moments, as the bride and groom share their emotions and joy with each other and their guests. The reception continues with the bride and groom performing dances with their parents, before speeches and other wedding ceremony traditions. We typically grab the bride and groom before dinner is served to quickly take cake cutting pictures which is a traditional photo couples want in their wedding albums. The couple doesn't have to cut the cake, since most venues will cut the cake and serve slices of it to the guests in attendance. After dinner is served is when the wedding celebration really begins with music and dancing. We candidly photography the bride and groom as they dance the night away with their guests. When night falls during the wedding reception with will usually get the bride and groom to create some portraits at night. We use a variety of lighting and backgrounds to create dramatic wedding photos with the moody backgrounds, or ornate locations most photographers overlook during a wedding day. Couture Bridal Photography is listed as Boca Raton's top wedding photographers for the most unique and stylish portraits taken during the reception when sneaking away from the festivities with the bride and groom. After the wedding and all out photography gear is packed up, the most important part of photographing a wedding takes place. Immediately after arriving home or to our hotel room in the case of a destination wedding, we back up every wedding photo to multiple hard drives. We also secure the memory cards to create multiple back ups of every photograph captured during the wedding. Once the images are backed up to create multiple copies, we begin the editing process. Using a variety of photo editing software applications, we view each photos and correct color, exposure and remove images that aren't absolutely perfect. 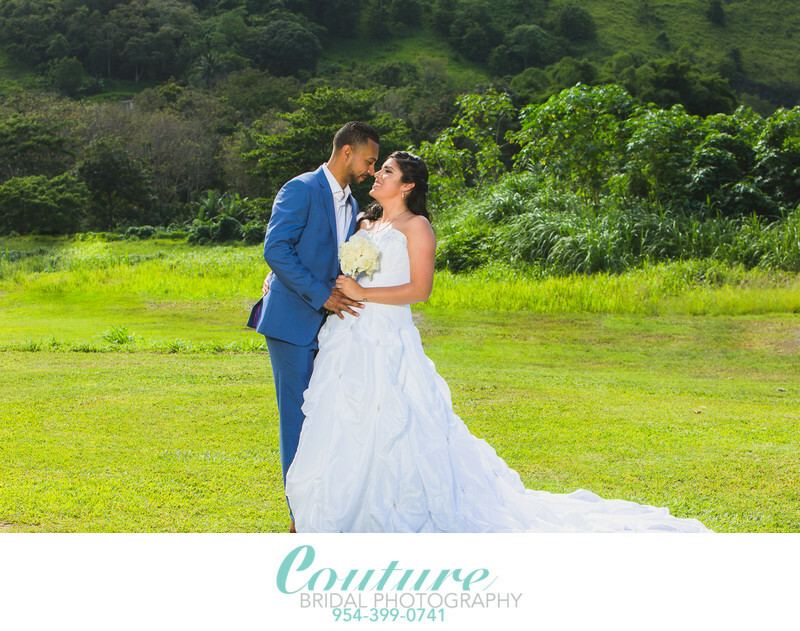 Couture Bridal Photography is known for delivering the most spectacular wedding photos with the highest standards in the wedding industry for sharpness, color accuracy and artistry. What sets us apart from other Boca Raton Wedding Photographers is our artistic approach to photography unlike many who just take snapshots. We capture and edit every image with an artistic eye, mind and heart to produce the most magical wedding images a couple can ever have. Alfredo Valentine, is the founder and principal photographer at Couture Bridal Photography. Alfredo first started taking pictures with a Canon Rebel G camera at the age of 16 around 1990. Studying photography in high school and college along with self study, Alfredo is now considered a master photographer. Prior to launching Couture Bridal Photography in 2008, Alfredo honed his craft at family events and photos of his children. Alfredo since 2008 has studied artistic story telling wedding photography from Jerry Ghionis, Cliff Moutner, Yervant, Roberto Valenzuela, David Beckstead and world famous celebrity wedding photographer Joe Buissink. Having have studied with and under some of the best wedding photographers in the world Alfredo created and delivers the most distinctly artistic storytelling wedding photography in Boca Raton. Boca Raton offers a variety of venues for every budget, size and style. Being Boca Raton's top wedding photographer, we have had the pleasure of photographing weddings at every wedding venue in and around Boca Raton, Florida. Creating a list of our favorite Boca Raton wedding venues is a very difficult task, since each provides its own unique backdrop, ambience and feel to a couples wedding day. One thing for sure is Boca Raton has a venue for any wedding. A few of our absolute favorite wedding venues in Boca Raton, would have to be the Boca Beach Resort and the Boca Raton Resort and Club. Both properties, owned by Waldorf Astoria prefer and recommend Couture Bridal Photography for all their weddings. 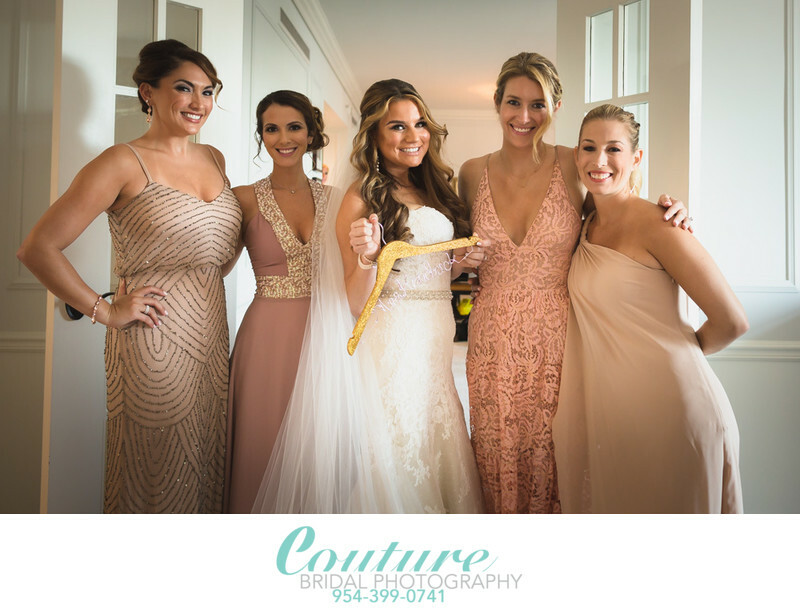 Couture Bridal Photography is also the preferred Boca Raton wedding photography studio for weddings hosted at the Waterstone Resort and Marina. We are also the top wedding photographers at the Pavilion Grille and the Addison. Planning a Boca Raton wedding starts with finding the perfect venue that will fit the amount of guests you'll be inviting that fits within your budget. Some couples do this on their own or hire many of the wedding planners located in and around Boca Raton. We can't recommend the best wedding planner, since we work with so many on the numerous weddings we photograph in Boca Raton yearly. We can recommend the best wedding floral designer and event decorator serving Boca Raton, though. Panache Style is the top rated Boca Raton and South Florida Florida designer and event decorator in Florida. We work with Kristen and her Panache style team closely on many of our higher end weddings. The second most important aspect of planning a Boca Raton wedding is to hire Couture Bridal Photography for the best wedding photography. As the premiere award winning wedding photography studio in Boca Raton, we book our weddings a year to 18 months in advance. 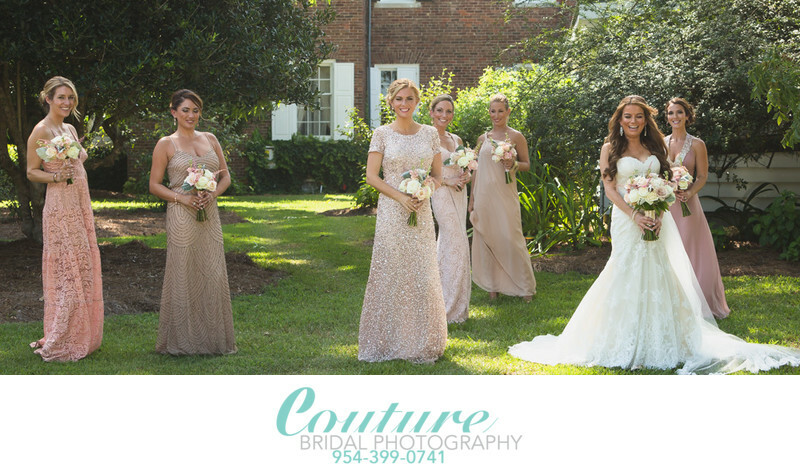 Couture Bridal Photography is a boutique luxury wedding photography studio located at 137 E Palmetto Park Rd, Boca Raton, FL 33432. We are known worldwide for the most authentic storytelling wedding photography in South Florida. Couples know us best for the most personalized photography experience they receive before, during and after their wedding along with the best bargain on wedding photography in Boca Raton. 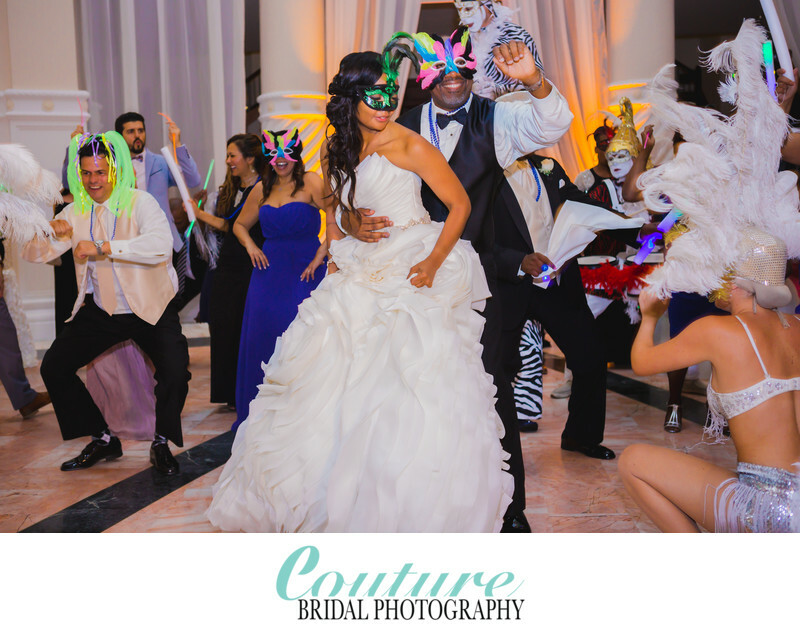 Couture Bridal Photography is best known for photographing destination weddings worldwide. Most notably weddings in Puerto Rico, Charleston, Colombia and the South Pacific. Boca Raton couples planning destination weddings call us for the best destination wedding photography services at the best prices. We love to travel and offer incentives for couples to hire us for their wedding photography anywhere around the world. The main photo on this page was taken during the bridal portrait session of this couples wedding day. 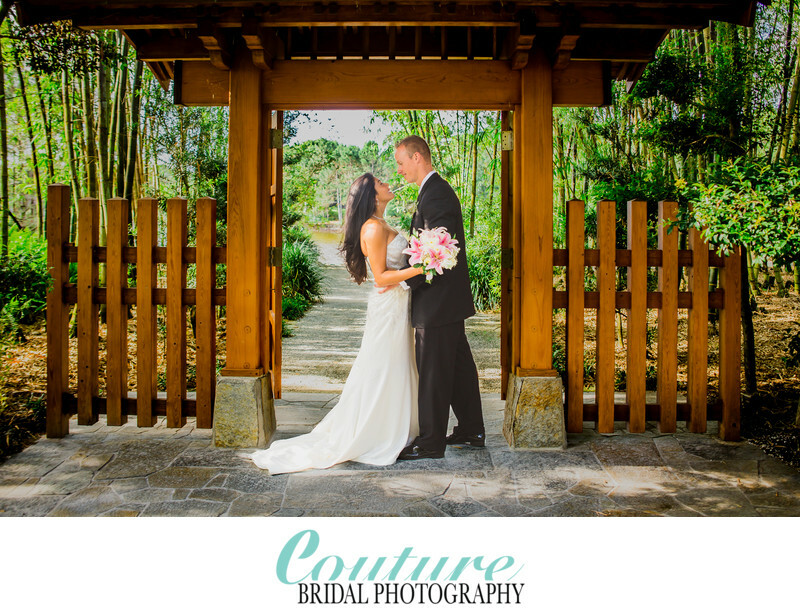 We took the time to drive to the Morikami Japanese Gardens where we took a variety of wedding photos throughout the Morikami property. The couples wedding was hosted at the Boca Raton Resort and Club where they had 200 guests in attendance. This couples wedding photos were delivered within 3 weeks after being edited and they purchased albums for themselves and their parents. Location: 900 South Ocean Blvd. Boca Raton, FL 33432. 1/400; f/2.0; ISO 100; 135.0 mm.